Which of the following has been linked to headaches, neck pain, pinched nerves, decreased lung capacity, and depression? If you answered B, petting puppies, then you would completely wrong and maybe even a cat-lover. The answer is C! Looking down for too many hours at your smart phone or tablet. 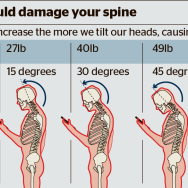 Text neck – If you feel like the weight of a small person has been hanging from your neck all day, you would be correct. Experts estimate that you are probably spending 700 to 1,400 hours per year people putting stress on your spine. Parents? You high-schooler might be the worst, spending an additional 5,000 hours in this position. As a chiropractor in Aventura who is treating an increasing number of children and teens, I can tell you the smart phone element has become a challenge as we are seeing more adolescents than ever with pain. Challenge accepted. If you want develop advanced arthritis and prematurely degenerated joints and discs, then ignore the link below. If you want to avoid pain, slumpy shoulders, irreversible disability, and endless complaining, click here for a step-by-step tutorial on our safer method for smart phone use, you digital athlete. If you’d like more 1-1 guidance on how to remove the weight of the world from your shoulders at our Aventura office, the doctors and therapists at Miami Sports Chiropractic & Yoga Center will get you out of pain and teach you how to stay out of pain. Let Us Help You!